Mühltal / Dusseldorf 20th February 2018 - Materials and technologies in metal-cutting manufacturing are changing - the challenges in milling remain: Customers increasingly expect ever better results, even when milling most complex shapes. 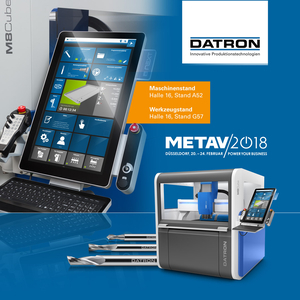 DATRON AG from Mühltal in Hesse presents a revolution in control technology at METAV 2018, which has coped with this balancing act: DATRON next makes operating a CNC milling machine almost as easy as using a smartphone. Materials and technologies in the machining industry are changing - the challenges of milling remain: Customers expect faster and better results even in complex shapes. DATRON AG from Hessian Mühltal presents a revolution in control technology at the EMO 2017, which has grown to this balancing act: With DATRON next, the operation of a CNC milling machine is nearly as simple as the handling of a smartphone. Making a complex process simple and comprehensible - the specialists at DATRON AG set this goal in the development of the innovative control "DATRON next". The result is impressive: a control system whose surface optics can compete with a smartphone of the latest generation: clearly laid out tiled optics, self-explanatory icons with intuitive control logic, clearly illustrated tools in 3D optics. "Button" or input was yesterday - today is swiping on the colored touchscreen and so is the machine: camera supported and productive within seconds. In the background runs software, in which the programmers have processed detailed technology at the highest level. Even true milling beginners find their way quickly and achieve best results with DATRON next. An example of the ease of use of the controller is the CAM Assistant. It guides the operator through program and tool management in just two steps. All tools are clearly displayed with information on type, dimensions and location. Within seconds, the right tool is selected. Equally fast is the setup of the workpiece. "We greatly accelerated and simplified this previously time-consuming process with the help of the camera and 3D sensor," explains Gregor Leinfelder, Head of Product Management at DATRON AG, explaining the particular innovation. This creates one of the most important prerequisites for a reliably perfect machining result. As a final step, DATRON next enables the 3D simulation of the workpiece to be milled. The revolutionary controller provides perfect control of the result even before the milling process. "No numerical input, no complex determination of the zero point during setup - this not only accelerates the work process, but also considerably reduces the sources of error," explains Helmut Neff, Director of Sales and Technology. "With DATRON next, every user can operate a high-speed milling machine. For our customers this increases the flexibility with a secure manufacturing quality. This, of course, increases the profitability of the customer’s company, because even less well-versed employees can be familiarized with the technology and handle it quickly. 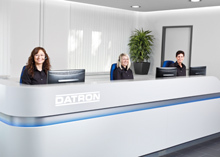 "For better planning of all resources, DATRON has also equipped the control with a RunScreen. It also provides information on the status and remaining time of the order at any time, even from a distance. You can see DATRON next from 18 through 23 September 2017 at the EMO show in hall 12, stand A40. You can see DATRON next from 20 – 24 February 2018 at the METAV in hall 16, booth A52. On 53 square meters, the South Hesse mechanical engineering company shows what is state-of-the-art in CNC milling today. "With a selection of our machines - equipped with DATRON next - our customers and the interested trade visitors can thoroughly examine the advantages of our new control R (e) volution," announces Thomas Frank, Director of Sales and Marketing at DATRON and adds: "The control innovation in milling originally presented for the first time at last year’s EMO has already received extraordinary attention worldwide." In addition to the main booth in Hall 16, the DATRON offer completes a separate tool stand in the same hall at booth G7. Here, too, the audience can look forward to experiencing highlights such as the 4-in-1 single glute end mill, for which there are special METAV promotions.